Every small business is prone to stagnation. And it’s not restricted to businesses that have been around for a very long time. Stagnation can happen more quickly than we think. Small business ownership isn’t just mom ‘n pop shops. It’s the $50M manufacturing business. It’s the $3M retail shop. It’s the $127M custom home builder. It’s the $225M car dealer. Water stagnates when it stops flowing. Ditto for your small business. When growth stops, when improvement isn’t highly pursued and when innovation ceases…you’re stagnant. It’s time for an infusion of what you’re lacking. And I’m not talking about capital (although your stagnation has likely resulted in cash flow pressures and a restriction in resources, including capital). Routine. Sameness. Staying the course. These are just a few of the many enemies you face in your small business. Yes, boredom results, but there’s a deeper – more powerful – enemy, ideas stop flowing. Stagnation. History. Not as in learning from it, but as in trying to hang onto it. Living in the past. Every successful business has to face this threat. Too much time spent admiring previous accomplishments freezes us. Makes us hesitate. Easton is my 5-year-old grandson. He just started playing T-ball. He’ll hit the ball, but he won’t immediately drop the bat and run to first. He’ll learn that he can’t afford to look where the ball is going before dashing to first. The enemy is we stop asking questions. Especially tough questions. We assume that what once worked – or what worked in the past – is going to keep on working. Those assumptions coerce us to not see the slow erosion of effectiveness of our past. This is especially threatening to our business if we’ve been in the industry for very long. We tend to think we’ve figured it all out if we’ve been in a space for a few years. All the dots in our industry have been figured out. Or so we think. Curiosity ends up being replaced by a “know-it-all” false confidence. It’s why so many industries get disrupted by newbies. Spend some time with 2-3-year-old kids and you’ll quickly get a lesson in curiosity. And you’ll also see why it’s so easy to lose it. Arrogance and pride. Too many small business owners are ashamed or embarrassed to be curious. They wrongly think it’s better to act like you’ve you’ve got all the answers. We get fat and happy. Laziness stifles accomplishment. Hunger is a powerful source of inspiration. Contentment is fine at the individual level, but it’ll kill a culture of accomplishment inside your small business. The big payday – success – has wrecked quite a lot of potential greatness. It’s a rare bird who can climb really high and still believe there’s a higher elevation left to discover. Most of us prefer to rest and enjoy the view. What do we do? 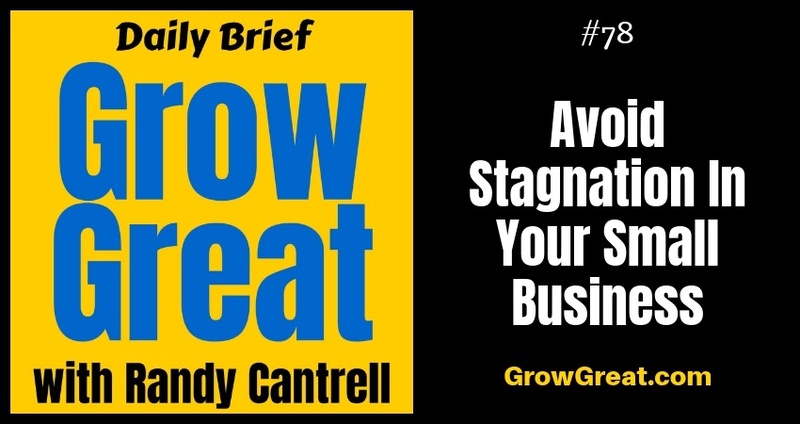 How do we avoid stagnation in our small business? One, don’t embrace loyalty over performance. Don’t hate me. I’m not talking about booting people just for the sake of it. But I am talking about not getting so loyal to people in your business that you avoid tough scrutiny. “Mary has been here 15 years. We can’t get rid of Mary.” That dog won’t hunt if Mary isn’t contributing enough to the company. Sorry, but unless you’ve decided to morph your small business into a non-profit or make it a charitable enterprise, Mary may need to go. If your culture has stagnated into a loyalty-over-performance culture…you’re in trouble. Instead, be loyal to performance! Two, get and maintain a diverse team. Are you an owner who enjoys being surrounded by folks who agree with every idea you have? It’s okay to admit it. It’s death to keep it though. You need contrarians. When I say “diverse” I don’t mean you limit it to the stereotypical categories based on gender or race. I mean in any and every category, perhaps especially based on experience. Don’t always look for the person who has the experience you think you need. This drives me mad – literally angry – when I sit down with HR people or top-level leaders whose go-to-move is the person with 5 years industry experience, an MBA or whatever else they think is most needed. It’s wrong and lazy! Translation: we want to hire somebody we don’t have to train or serve. We want somebody who can hit the ground running. When you do that, you lose everything I’ve talked about. Ideas. Questions. Curiosity. Ambition. Look at people who have no experience in your space, but they have experiences, skills, and talents that may be easily adaptable to your environment. I know why you don’t do it. You’re stuck. You’re following the leader instead of being a leader. And you’re lazy, settling for the quick fix instead of putting in the work to push yourself and your company to new heights. As the owner, you’re the top dog. The team takes their cues from you. They know how you roll. And what they know may be very different than how you think you roll. Don’t fool yourself. You can fancy yourself to be something you’re not. Many business owners do. Get real with yourself. Ideas, questions, curiosity, and ambition begin with YOU. It’s all too common for small business owners to feel like they embrace all these things, but when you talk with team members you hear just the opposite. Every small business owner needs a reality check. You need somebody – or a group of somebodies – willing and able to help you grow as a business owner and leader. We all have blind spots. And weaknesses. And strengths. The more we shore up our weaknesses, the more we bet on our strengths and the more we eliminate our blind spots…the better we’ll be. Our growth, improvement and transformations as business owners has a direct impact on the growth of our business. It seems so obvious, but so many business owners devote very little time or money investing in themselves. Partly because they don’t think they need it. Partly because they’re unaware that the path to greatness is humility – the realization that there’s always so much left to learn, and so much more left to accomplish.